Many of our cotton lawns were moved to the 30% off table during the sale, making room for a new group of beautiful lawn prints! The feel of these fabrics is simply amazing. Many people are surprised they are cotton! Whisper-soft, ultra smooth, with a rippling, flowy drape, this is cotton at its best. Plus, the prints are lovely. Here are a few of my favorites. Are you frustrated with your dressmaking dummy because it doesn't really match your shape? Or perhaps you've avoiding buying an expensive dummy because it's just not close enough? Here's a simple solution: make your own dress dummy - out of duct tape! Next week at Treadle, the Material Girls will be hosting a workshop to create your own duct tape double. You'll end up with a dress dummy that perfectly matches your figure. The class is Wednesday, August 1st. For more information or to register, stop by the store or call us at (651) 698-9690. We recently received a group of fabrics printed with ornate plates, forks, knives, serving dishes, and other tableware. There is a panel to make a table runner and another to make placemats, as well as a few coordinating prints. These pieces were made by Nanette Sutherland. Nanette offers longarm machine quilting services and will pick up your quilt top at Treadle, then drop it off at the store when it's done. Stop by Treadle to see more of Nanette's work or get her contact information. We've had some great deals at our Summer Sale this past week, and there are still plenty of bargains to be had! Come in today and tomorrow, Sunday July 22nd, for your last chance to shop the sale. ALL fabrics, including silks, velvets, and oilcloth, are 20% off the original price. Selected cotton lawn prints and solids are 30% off, and selected cotton prints are 40% off! Plus, our 50% section is stocked with a variety of great deals, including rayons and wools. We're open from 10am to 5pm Saturday, and 1pm to 5 pm Sunday. These 100% linen knits have been a hit at the store lately. They have a beautiful drape, somehow soft and crisp at the same time, with a cool feel in the hand. The slightly slubby texture adds visual interest to an otherwise plain knit. This fabric does shrink when machine washed, and we've also heard that the finished garment can grow slightly, so use slightly less ease than you normally prefer. But this fabric works up beautifully, into comfortable, easy-to-wear garments just right for summer. This simple boat-neck tee made by Mary is a perfect example. I literally gasped when I walked by this velvet, tucked back in the corner on our velvet rack. It's a printed cut velvet in a gorgeous peacock design. The velvet is in shades of green, plum, raspberry, and gold; the cut-away areas are sheer grey. We photographed this draped over a piece of white fabric because the sheer areas really show best with a plain, light solid behind them so as not to distract from the wonderful pattern. This is a pretty large-scale design, so it would work best in a project with large, open pieces and without too many seams. I don't think these prints came as part of the same collection, but I found them to have such a similar style, with one-way, almost geometric layouts and bright, bold colors, that they seemed to belong together. And what could make more perfect opposites than City and Country? The City print features houses, skyscrapers, cars, trees, and stoplights on a light blue background with subtle graph lines. The Country print features farm animals with their farm family, tractors, hay bales, and garden plots. The stacks of sheep and pigs are just irresistible! 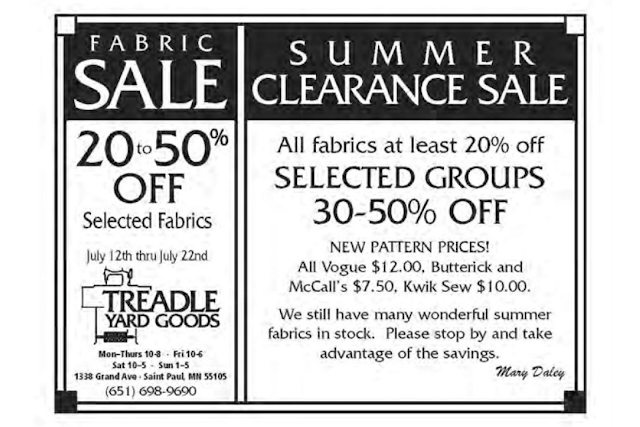 Treadle's Summer Sale begins this Thursday, July 12th! Come in and check out all the great deals! We recently got in this selection of heavier-weight silks with a rough, nubbly texture that would make them great suitings. The subtle sheen and delicious texture would be wonderful in crisply tailored jackets and narrow pencil skirts. The rich berry and jewel tones or soft muted shades of these silks would be lovely made up in a fitted, polished style to add variety to a work wardrobe, or dressed up with subtle details and accessories for a mother-of-the-bride or -groom ensemble. PRICES SLASHED ON ENTIRE MCCALL’S FAMILY OF PATTERNS! We are happy to announce a significant reduction in prices for all Vogue, McCall’s, Butterick and Kwik Sew patterns. Treadle is a member of Fine Fabric Stores, a small national organization of independently owned fashion fabric stores dedicated to promoting fashion sewing. Our fearless leader, Suzan of Stone Mountain and Daughter in Berkeley, recently concluded negotiations with the McCall Company for discounted prices on their patterns. This is unprecedented! Our group members will now be able to purchase and offer these wonderful patterns at reduced prices. The big box retailers have enjoyed huge discounts for years. Effective immediately at Treadle ALL Vogue patterns will retail for just $12, Butterick and McCall’s for $7.50, and Kwik Sew for $10. We are grateful to everyone who has purchased patterns from us in the past and thrilled to be able to offer these discounted prices to you. Check out this cute cowl-neck tank sewn by Treadle owner Mary. It's made in a lovely striped knit fabric from McCall's 6078. Knit fabrics are so popular for sewing right now, and we have such a great selection for summer. Knit garments don't require much shaping to get a good fit, so the sewing is simple and quick. And of course, they are so comfy and easy to wear.